A plan to build new rail links with Heathrow Airport and connect Windsor's two train stations have been submitted to the Government. The first phase of the privately financed Windsor Link Railway would involve a new tunnel in the Berkshire town to enable trains to run between stations which are unconnected despite being just 300 metres apart. Services from London Waterloo currently terminate at Windsor and Eton Riverside, while those from Slough only go as far as Windsor and Eton Central. A through service would provide a boost to the M3 and M4 corridors, according to the proposal. Phase two of the scheme would involve new lines from Heathrow to the west and possibly the south. Huge budgets The first phase would cost an estimated £370 million, with the airport links requiring a budget of around £1 billion. Windsor Link Railway says it has established a consortium to pay for the project, including European infrastructure investment fund Meridiam SAS. The groups involved would aim to recoup their money through revenue from fares, parking and boosting land value. Services could begin running in around five years. 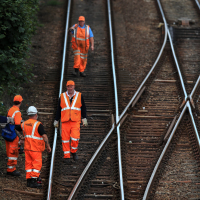 The Government has sought privately funded bids to build new rail links from Heathrow. A decision on the next stage is expected in the autumn. Non-government funded A Department for Transport document outlining the call for "market-led proposals" says "central government is far from having a monopoly on good ideas". George Bathurst, founder of Windsor Link Railway, said: "If accepted, this will be the first new railway not requiring net funding from government over its lifetime since the days of the original railway companies. "This market-led approach, being promoted by the Secretary of State, is the future of our railways and will ultimately replace the current franchise system, leading to lower fares and more reliable journeys." Heathrow is one of the world's busiest airports - be sure to check the fine print of your travel insurance policy to see if you're covered for the unexpected when travelling.